Disaster recovery (DR) is often cited as a potential killer app for cloud storage, and its appeal is unmistakable. 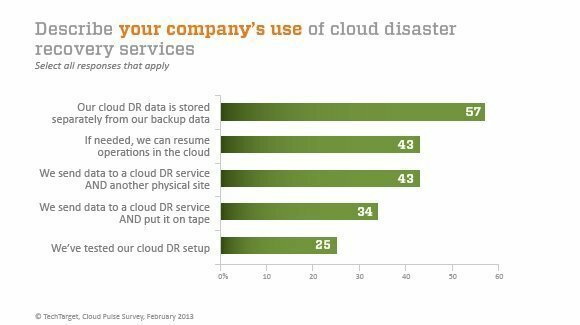 Thirty-five percent of our survey's cloud storage users currently employ cloud disaster recovery services; overall, 28% of all users of cloud computing resources, not just cloud storage, list DR as one of their cloud-based applications. Cloud DR services give small and midsize companies an affordable second physical location where they can store copies of their critical data. Cloud storage is far cheaper and much easier to maintain than a collocated or managed-service recovery site; when it's combined with the ability to use cloud computing services to start up replacement servers, it can allow companies with even modest IT resources to recover quickly and effectively if disaster strikes. Forty-three percent of our cloud storage users believe employing cloud disaster recovery services will allow them to recover in this manner. Our cloud survey indicates that companies treat their cloud-based DR data with some special care and handling. For example, 57% keep disaster recovery data separate from normal backup data, an advisable practice as DR is likely to require more complete data from more sources than simple operation backups. And a lot of companies aren't putting all their eggs into one DR basket: 43% send their data to the cloud and to another physical site, and 34% also spin their DR cloud data to tape.